Yesterday, while reading the Supreme Court orders related to air pollution in Delhi, I came across something which I thought would be great to share. As some of you might be aware, the court passes directions from time to time to create funds for the Delhi state government to be used for public good. Public good could be, from creating walkways and cycling tracks for users like pedestrians and cyclists, as they constitute 37 per cent of Delhi’s population or from augmenting the number of buses to serve the 26 per cent of Delhi’s population who are dependent on them (Census of India, 2011) and so on. Brief research leads me to find that the Supreme Court created three such funds in the last 15 years. First was way back in 2002, when the court imposed fines on diesel bus owners who continued to ply their buses even after the set deadline of January 31, 2002. The court directed Delhi’s transport department to collect Rs 500 per bus per day that will increase to Rs 1000 per bus per day after 30 days of operations of diesel buses and this fund should be deposited with registry of the Supreme Court. The initial collection from this fine was Rs 30 crores and after 15 years the sum is increased to roughly Rs 60 crores after adding the interest. Second, was in the year 2015, when the court imposed Environment Compensation Charge (ECC) on trucks entering Delhi. 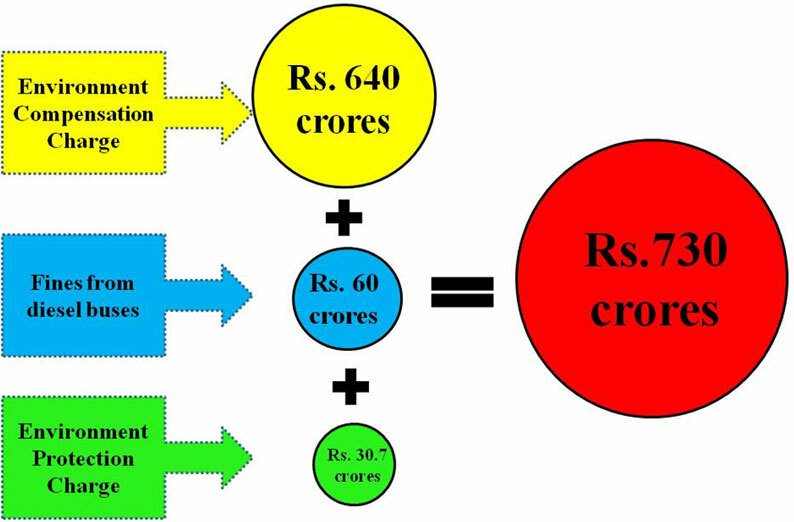 As on April 7, 2017, the amount collected from this was as high as Rs 640 crores. Third was in 2016, when the court imposed Environment Protection Charge (EPC) of 1% on the sale of 2000cc and above diesel cars in Delhi and NCR. This amount as on April 7, 2017 is Rs 30.7 crores. Adding these up, there is roughly Rs 730 crore with the government. This equals 20 per cent of the total money allocated for development in Delhi’s current budget, and more than twice the amount allocated for water subsidies this year. The sum is constantly increasing as ECC on trucks and EPC on 2000cc and above cars are still been imposed. The court in 2016, directed the Delhi government to use Rs 120 crores, collected as ECC, for installation of Radio Frequency Identification (RFID) at the 13 major entry points into Delhi. The purpose of putting RFID was to monitor the actual number of trucks entering Delhi and to make the ECC collection process cashless. Then in 2017, the court directed the Central Pollution Control Board (CPCB) to use Rs 2.5 crores from the fund for installing air quality monitoring stations in Delhi and NCR. These expenditures amount to a mere 17 per cent of the entire fund. Where can this be put to use? The Environment Pollution (Prevention & Control) Authority in its report submitted in the Supreme Court in May 2016, said that the Delhi government has enough space for parking 1600 buses. This money can easily be utilised for buying buses and put some life in the deteriorating DTC fleets. 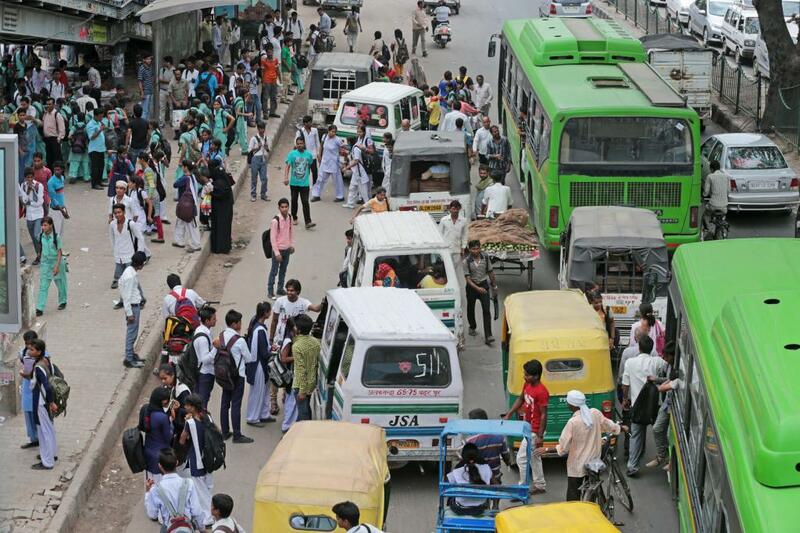 According to the Delhi Traffic Police, the city witnessed 1,622 road accident deaths in 2015. The share of pedestrians and cyclist of the total is 46.4 per cent. To avert the high number of pedestrians and cyclist being killed in road accidents, the government can construct dedicated NMV lanes for them.